When visiting Southern California, one of the key ingredients to a proper trip to the state is renting / borrowing / stealing (maybe avoid that one) the right automobile. Odds are you’re going to spend a lot of time sitting in traffic and being on the road. There’s no effective public transportation so a car is your best option for getting around. That’s why you really want to get the right one, unless you’re into point A to B appliance vehicles, and odds are you’re not since you’re reading this site, settling for an econobox is out of the question. 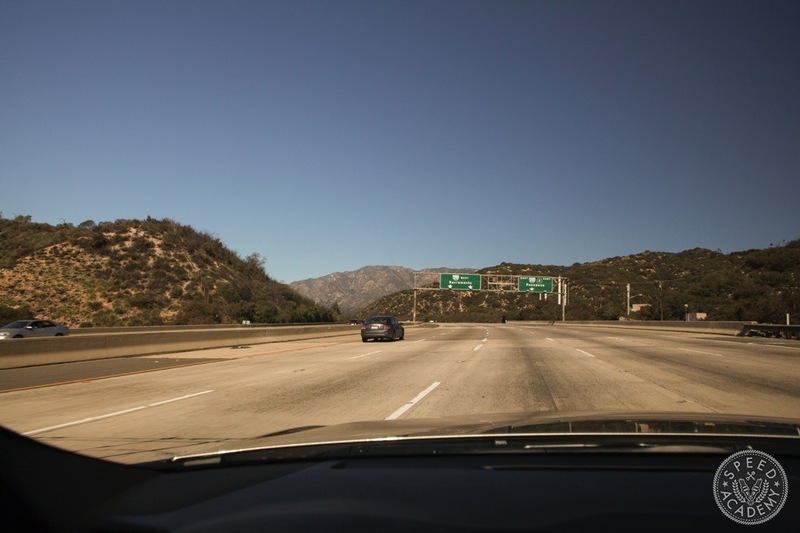 SoCal car rental companies offer some great options, from convertibles or sports cars. They can be a bit pricey, but it’s worth the upgrade to enjoy the sunny weather and amazing canyon roads. 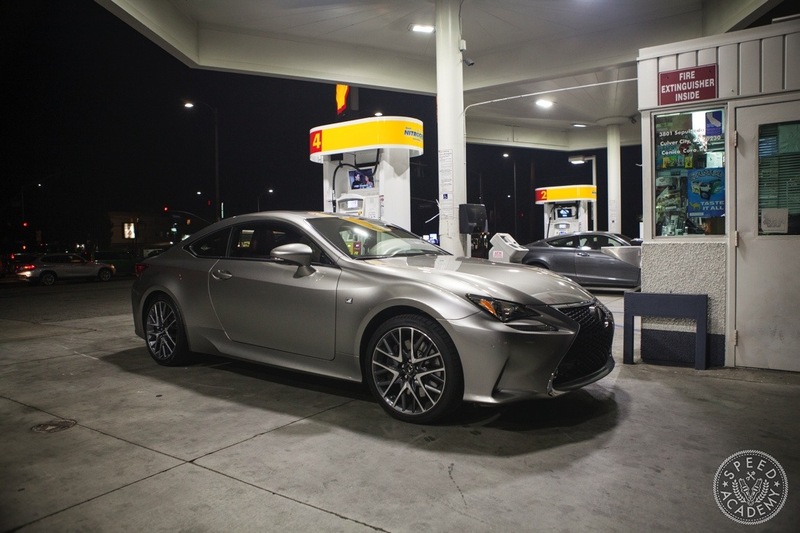 I, on the other hand, was lucky enough to make a call to my good friends at Lexus and borrow a brand new 2015 Lexus RC 350 F Sport press vehicle for the week. 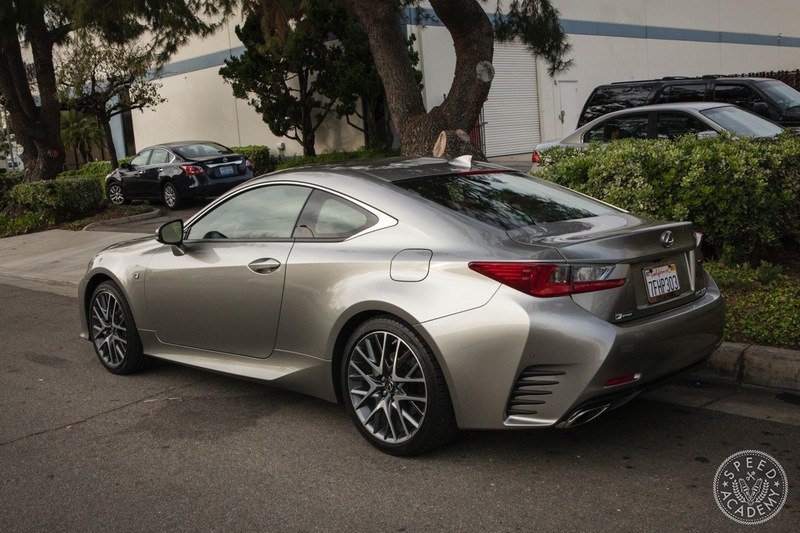 It was love at first sight; boy oh boy is this Lexus a looker! The Atomic Silver paint is simply stunning and shows off all the bold and aggressive lines of the RC. I’ve heard some complaints about the way this car looks, but in my opinion it’s one of the most visually appealing automobiles on the market. 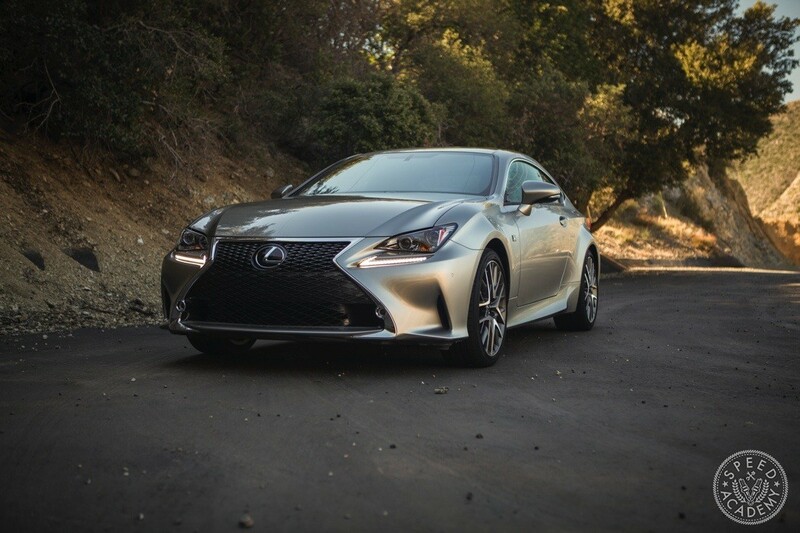 The bulging hood combined with those unique headlights and now signature Lexus front grille set the RC 350 F Sport apart from its German counterparts, which is a good thing. 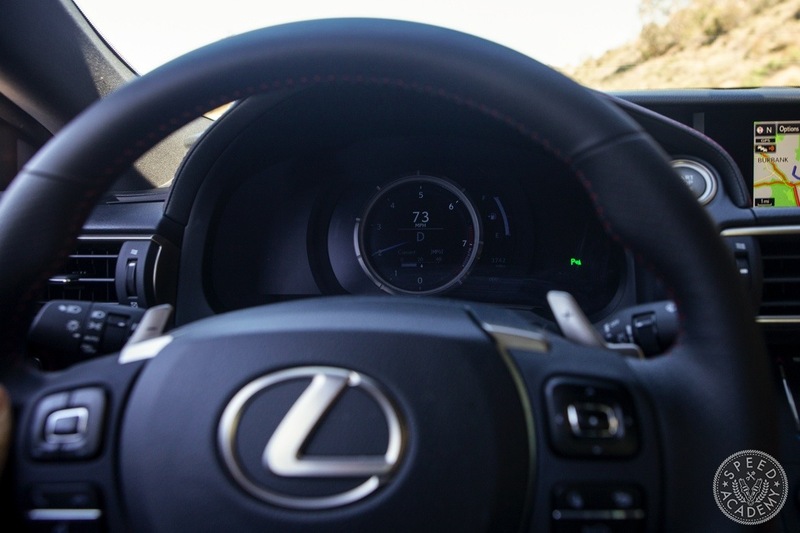 There’s no mistaking that you’re driving a Lexus, nor is the brand trying to build or be what BMW and Audi are. I admire that in many ways, because it’s easy to get caught up in what the competition does best, but it’s always best to blaze your own trail and the RC does exactly that. 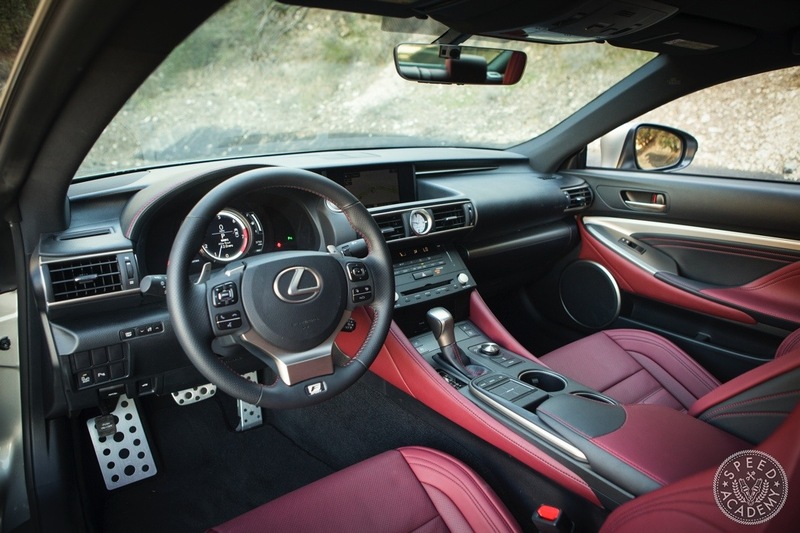 The cabin is made of all premium materials and clearly takes styling cues from the Lexus LFA; a good thing in my books. I particularly like how the center console integrates itself into the dash, providing a sport cars vibe for a car that’s really more of a grand tourer. 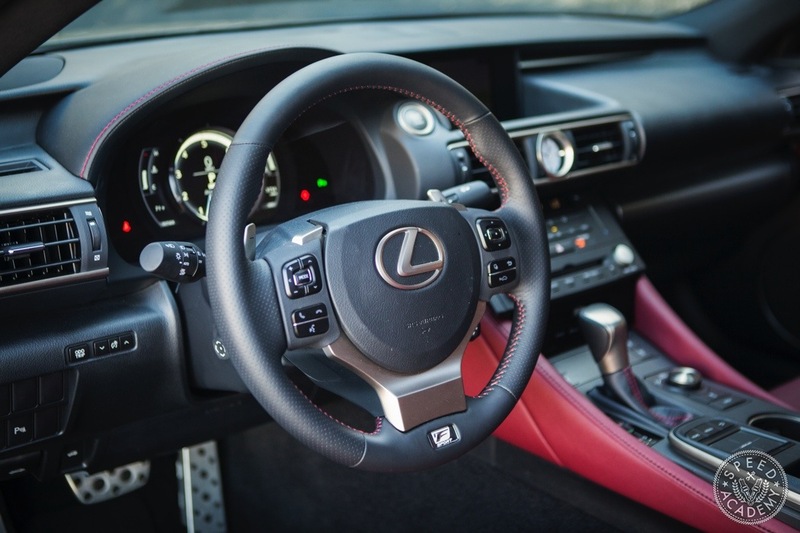 Another favorite is the F Sport steering wheel. It’s just the right diameter and thickness, while the perforated leather provides a great tactile experience for the hands. The seats are aggressively bolstered but also provide a great deal of comfort for average sized frames. I spent 5+ hours a day sitting in the driver’s side seat without any fatigue or discomfort. 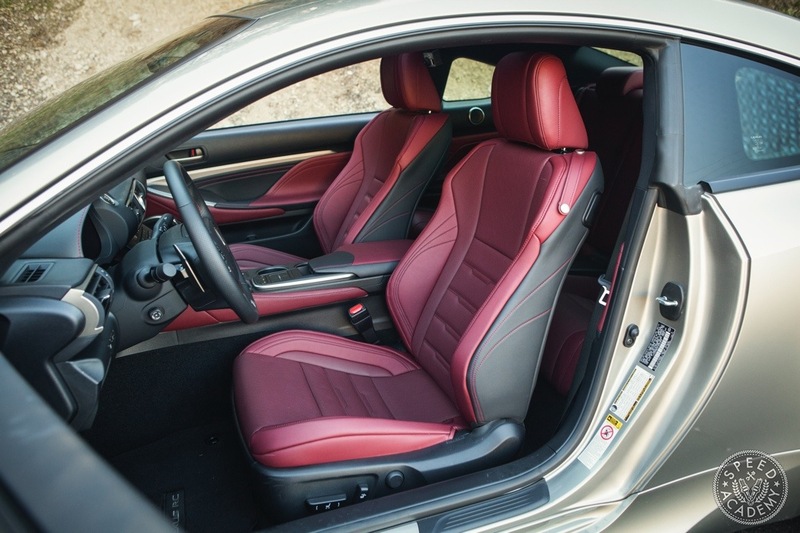 One should note the clever stitching design in the seats giving them a more sophisticated and sporty look versus simpler, more plain jane seats found in other similarly prices vehicles. 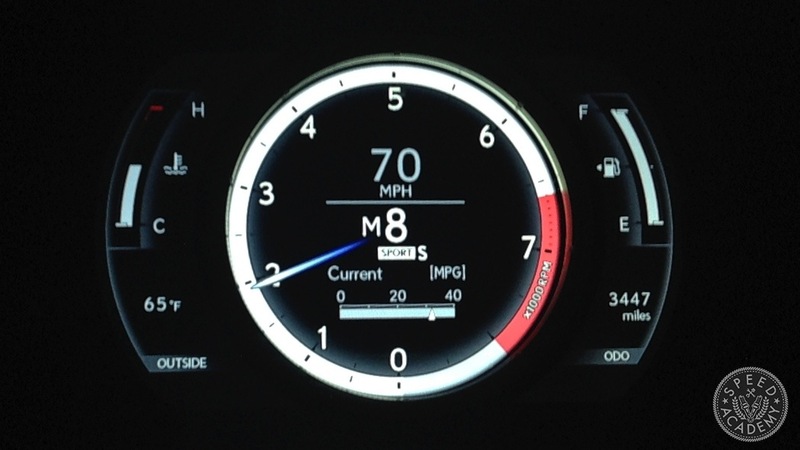 Lastly, the gauge cluster is an exercise in functional simplicity. I adore the center tach mounted display with a host of vehicle information options shown on the sides. Someone needs to build a unit similar to this for the aftermarket! Here’s a good look at the cluster at night. Tell me that isn’t a thing of beauty. Under the hood there’s a whole bunch of plastic but I assure you there’s an engine underneath it all. 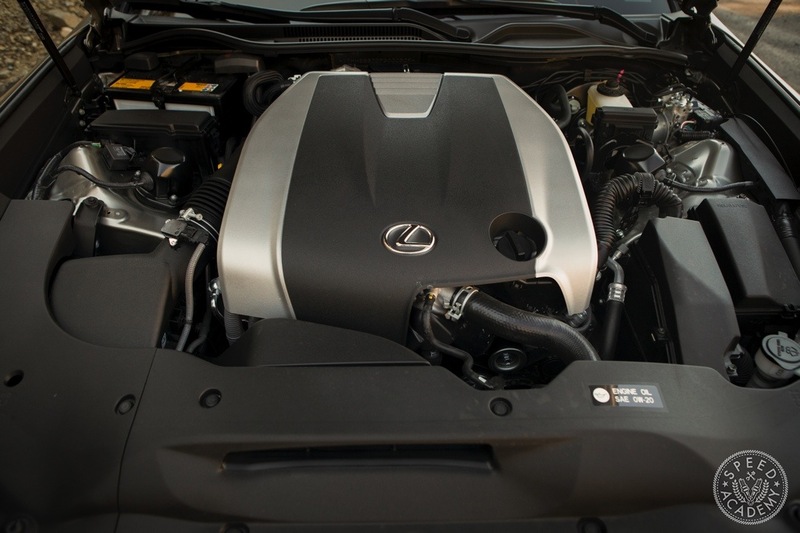 A 306-hp, 3.5L naturally aspirated V-6 powers the RC 350 F Sport, which is mated to an 8-speed automatic transmission with no option for a manual (boooo!). The F Sport package also includes an adaptive variable two-mode suspension, 19-inch wheels, massive 14-inch two-piece rotors with 4-piston caliper brakes and the sport interior with enhanced styling cues. Is it worth the extra $5,000 or so extra dollars? I definitely think so, considering aftermarket equivalent upgrades would cost significantly more to match the performance. Specs aside, how does it perform and drive? 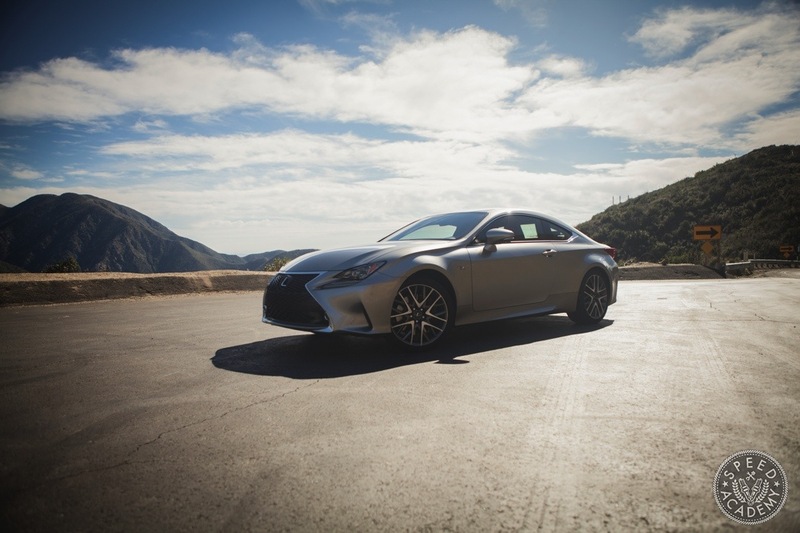 I can assure you if you’re in the market for a luxurious daily driver that excites the senses behind the wheel, the RC 350 F Sport fits the bill very well. It’s quiet and comfortable when cruising around, the 8-speed slushbox is silky smooth, and despite the V-6 having to overcome all 3800 lbs of it, the RC is eager to reach your desired speed when a good amount of throttle is applied. It’s by no means a rocket ship, but the V-6 is more than adequate and well matched to the chassis and driving dynamics delivered. Official MPG ratings come in at 19 city / 28 highway. I was able to achieve near 30 mpg cruising on the highway and averaged around 23 mpg for the week, which is impressive for a vehicle of this size and weight. 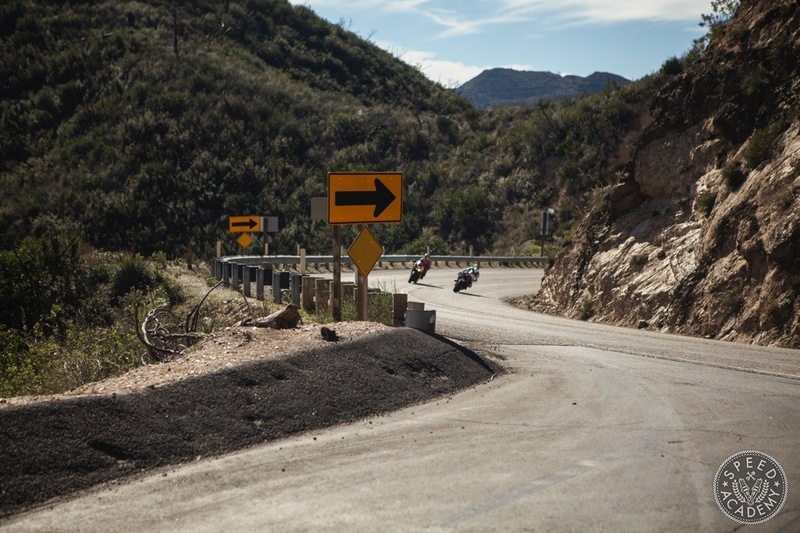 Southern Californians are spoiled with their year-round summer-like weather, but another gold mine that they’ve got access to are the scores of amazing canyon roads. These roads are the perfect playground to evaluate a vehicle’s handling, braking and performance attributes, so I’ve gotten to know them well during my time living in SoCal. 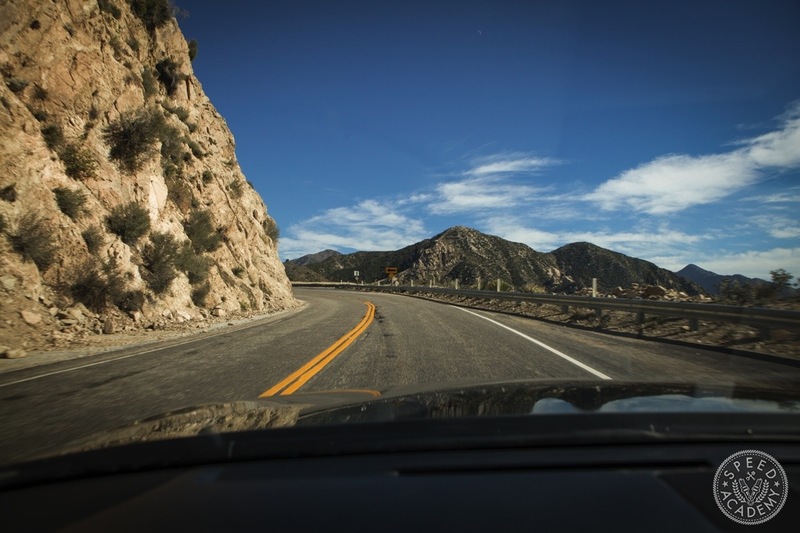 This is Angeles Crest Highway. It’s the perfect mix of technical tight turns and elevation changes to challenge any car and driver. It seems to be an extremely popular spot for motorcyclists too, as I saw more of them up here than their four-wheeled counterparts. With the RC 350 F Sport in Sport S mode, the most performance oriented and aggressive driving setting, I tore through Angeles Crest at a good 7/10ths pace (It’s a public road after all) and was rewarded with an agile vehicle willing to respond to quick inputs and transitions. However, even with the willingness of the RC to tackle the tight corners and downhill braking zones, its considerable mass is noticeable. Not in a ‘holy moly this car is heavy’ manner, but more of a ‘If I were 400 lbs lighter I could brake later, accelerate harder’ sort of way, which would certainly up the fun factor in a big way. Alas though, the canyon roads (or race tracks) are not what the RC 350 F Sport was built for, so I don’t want to take away from it too much, because the level of grip from the 19-inch summer tires was impressive and the brakes provided excellent modulation with no sign of fade throughout the day. Like I said, if you’re out for a 7/10ths canyon run, then this vehicle is well up to the task. 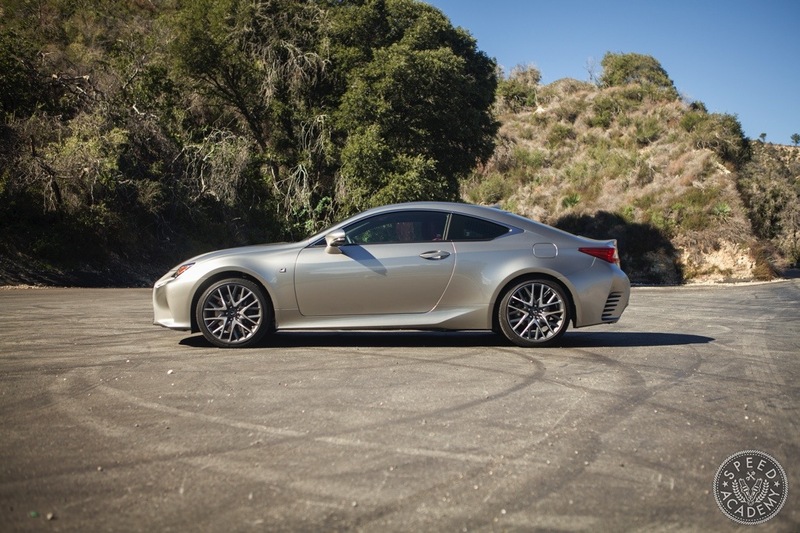 in a Lexus RC 350 F Sport"
California Canyon Roads + Extended test drives = Awesome. Those red seats look premium, however that engine bay would be disappointing at a cars and coffee…not worth the hood pop.